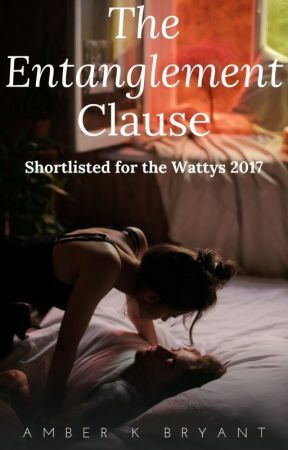 Welcome to The Entanglement Clause! TEC is now a video game! Her heart was an impassible barrier, and yet somehow, he&apos;d managed to breech it. Or more like, he&apos;d tossed a grenade at her, then waited until it exploded so that he could crawl through and invade the safe space she&apos;d tried so hard to create. Now, Emmie was left with dust and debris and a big hole where once a towering wall had stood. It would take time to repair, but as she lay in the silky cool sheets of Ryker&apos;s bed, attempting and failing to find sleep, she couldn&apos;t begin to contemplate what the repair process would be like. Overwhelmed, she let the hole exist, let the mess be a mess –let herself be a mess. The moon had set over the stormy sea before she managed to close her eyes and keep them closed. Only a few hours later, she woke to a knock on the door. Confused for a moment as to why she wasn&apos;t in her own bed, the events of the past night quickly caught up to her. "Emmie, we should go." Gruffly spoken, words cracking every other syllable. It didn&apos;t sound like Ryker had gotten any more sleep than she had. If she&apos;d been a more vindictive person, she might have taken a modicum of pleasure in that fact. Instead, all she could muster up was a dull sort of despair. She&apos;d known that a negative reaction to her revelation was a good possibility. It was her own fault that she&apos;d hoped for something more from him. She could own up to her own wrongdoings, but she refused to take the fall for every crappy relationship he&apos;d ever had. It wasn&apos;t fair of him to pin the sins of others onto her. She wouldn&apos;t stand for that. After escaping a life-threatening situation in Chicago at the hands of men who wished to use her for their own purposes, she wasn&apos;t about to let a man use her ever again. "Emmie? Are you awake?" The doorknob rattled. "I&apos;m up. Go away." She swung her legs off the bed and steadied herself as she sat up. Her fight with Ryker and the lack of sleep had left her woozy. She squeezed the soft cotton quilt, letting it ground her while breathing in and out as deeply as she could. "Are you all right?" The doorknob stilled as the human knob holding it waited for her to respond. "Just give me a moment. I&apos;ll meet you downstairs." Five minutes later, she was dressed, her hair swept back into a functional ponytail. She&apos;d rinsed her face off in Ryker&apos;s master bathroom and had done her best to cover the puffiness around her eyes with makeup. It wouldn&apos;t fool anyone, though, especially Trisha. She was already dreading that conversation. Grabbing her purse and steeling her resolve, she stepped out into the hallway beyond Ryker&apos;s bedroom. The staircase loomed in front of her, and beyond it, the two-story windows revealed an ocean hushed in darkness, the sun having yet to rise in the East behind the house&apos;s perch on the continent&apos;s western edge. Taking a few unsteady steps down the stairs, Emmie sought the railing for support and made her way down to the ground floor. Ryker waited for her in the adjacent hallway, keys in hand. He was unshaved, but otherwise appeared as he normally did, casual dress and disposition hiding what she knew now was a mountain of emotion.